Naseeruddin Shah's flowing prose smacks of the same devil may care attitude that drives his eloquent speech, a defining trait that invariably makes way for juicy media bytes underlining his no holds barred opinion about individuals and institutions above everything else. Add to that his uncanny knack of making himself readily disagreeable even on agreeable matters and you lose further connect with the priceless Naseer - the eternal thinker and experimenter, God sent for the cause of Indian theatre and cinema. 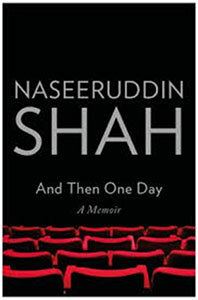 His memoir 'And Then One Day' is replete with his trademark searing probe into personal and professional relationships as also his own doing and undoing in life...all arresting admissions and annotations, complete with graphic detail, that have been generously quoted in review after review of this seemingly casual but unmistakably pivotal book. But in the more than proportionate focus on what media finds the 'deliciously' endearing stuff (in what reads like a queer blend of The Kite Runner and Shantaram), the enduring content has been largely discounted if not snubbed. Shah would of course care less since the prime motivation for the book, by his own admission, was to get it out of his system ahead of any genuine urge to share his story with his readers. But for keen students (not necessarily serious students), mulling over his highly incisive notes on theatre and cinema, ideally a matter for a separate book, would prove enlightening and even enabling in charting their respective careers towards fulfilment. Shah the actor is a rare species, unconditionally unmindful of the worldwide commendation his work has fetched him over the years... even ready, nay keen, to voice his inner discontent wherever and whenever he feels it, even if arising from some of his much acclaimed performances that are often cited as scintillating case studies. It's this quality of his that sets him apart from most of his equally competent peers who still find it difficult to believe this man acts for the sheer thrill of it. Any awards and accolades are only beside the point if not pointless. For students of theatre, cinema and life (not necessarily in that order), regardless of their age and experience, there're plenty of enriching insights, at times self-deprecatory, interspersed in the 150 pages. Shah's heartfelt notes on method and classical acting, Grotowski in theory Vs Grotowski in practice besides the style and substance of such stalwarts like Ibrahim Alkazi, Roshan Taneja and Satyadev Dubey merit the reader's undivided attention and are best read than cited. In the context of FTII student films, Naseer remarks: 'All they should have been doing was getting the nuts and bolts of film-making right, but instead they were hell-bent on making films of cosmic significance and conveniently resorting to ambiguity or abstraction when what was required was representation in truthful human terms' Couldn't agree more. In fact, several offbeat films of the supposedly 'New Wave' suffered from this inherent flaw. Consider Naseer's take on his hugely acclaimed roles in 'Junoon' and 'Manthan': "I did precisely what I should not have done, but didn't manage to completely ruin either film with my misguided energy." Naseer feels his relentless focus on the characterization diluted the very ideas they represented. Well even if discerning audiences noticed a tinge of a theatrical performance in Nasser's outbursts like "Javed bhai, Hum Delhi Haar Gaye hai", they hardly found it self-defeating. It's only the unforgiving benchmark of Naseer's detached probe that makes him own up the glitch, essentially a directorial flaw and a painfully recurring feature of every Shyam Benegal film (much before his fatal derailment with such ghastly star-stuck products like Zubeida, Welcome to Sajjanpur and Well Done Abba) including his critically acclaimed Nishant. Barring Naseer, Amrish Puri, Anant Nag and to an extent Shabana Azmi, almost every other character in Nishant seems to be trying too hard to make an impression, some even ham in the process. No wonder, the glaring divide between the rustic enactment of the real locales handpicked to 'perform' the crowd scenes and the artifice of the superimposed play-actors assumes comic proportions in many frames. How fatal could it get for a critically acclaimed film? Well, making a documentary on Satyajit Ray is way easier than matching his conviction and craft in filmmaking. Notwithstanding the accidental opportunity that came Naseer's way to work with offbeat champions like Benegal, Mrinal Sen and Gautam Ghose, the sheer abundance of his talent clearly deserved the green house of at least one Ray film. That it never happened should go down as one of the biggest tragedies of Indian cinema. Elaborating his love for theatre, Naseer remarks, "The finest definition of theatre that I have come across is one-actor-one-audience implying of course that any meaningful interaction between two people anywhere fits the definition of ideal theatre, with the same qualities needed of both participants as are required from them in an actual theatre. Theatre really is a one-on-one experience." Bull's eye! Wish we could also regard theatre as a green space of possibilities - as actors, directors, critics and spectators - to let the fulfilment reside in the possibilities somewhere. Talking of the Hindi film obsession with Shakespeare, he says, "There is no clich? in Hindi cinema that is not borrowed from the man, and I often wonder what popular Hindi cinema would have been like without Shakespeare's source material?" Absolutely, Shakespeare's predictable plots are tailor made for Hindi cinema but the commercial makers at least are not conscious of their 'inspiration'. Worse are actually those offbeat makers who have unabashedly launched a 'Bard adaptation' factory in the name of creativity. After all, what could be a better substitute for thought and a better vehicle to win worldwide fame? As for his tryst with commercial cinema, how we wish he stops analyzing his work and starts enjoying his escapades instead. Some of his masala films have been way better and bearable than his horrific offbeat adventures like Saat Khoon Maaf, That Girl in Yellow Boots or Pappu Can't Dance Sala. Even Sunaina will rate higher in comparison. Shah could learn from the example of the hugely talented Farooque Sheikh. Comedy or tragedy, mainstream cinema or art film, leading man or character artiste, big banner production or small budget film, silver screen, small screen or stage, serials or reality shows, he quietly etched his inimitable charm across every genre and media. Whether as the hero in Yash Chopra's Noorie, Big Bachchan's friend in the hugely forgettable Toofan or Ranbir Kapoor's dad in the recent Yeh Jawaani Hai Deewani, the shelf life of Sheikh's contribution enjoyed more longevity than the films themselves in most cases. Even friend Om Puri has had a great run in both worlds. Whether as the tribal victim of Aakrosh or the flirtatious Sardar of Singh is King, he's the same adorable man. Nasser has done the same in his career but has denied himself the delight. It was reassuring to note Naseer's tribute to the genius of the legendary Kishore Kumar. He rightly contends Kishore, like Shammi Kapoor, was an undervalued actor but had Naseer been a little more musically inclined, he would also have appreciated the fact how he poured his heart and soul to energise the below-par Randhir Kapoors, Kabir Bedis, Deb Mukherjees, Vijay Aroras, Anil Dhawans and Rakesh Roshans, how he helped accomplished artistes like Sanjeev Kumar, Vinod Khanna, Shashi Kapoor and Rishi Kapoor to underline their reeled emotions and, of course, how he immortalized the Dev Anands, Rajesh Khannas, Uttam Kumars and Amitabh Bachchans on screen. That was acting and singing in the same breath. We must profusely thank Naseer for his memoirs for we would happily overlook its inadequacy (given that much has happened beyond the covered time span) or even its 'superfluities, slang, swear words and exclamation marks' than having to sift through his unvarying media interviews and updates devotedly informing us of his harmonium lessons, his undying love for Farah Khan's films, the glorious anti-Sholay fixation or the rather taciturn Bhaag Milkha Bhaag dissection. Naseer bhai, 'you are a very good actor but'... wish you turn more receptive to your nuisance-free admirers at least who genuinely feel sad when your wily detractors scornfully raise the question 'Naseeruddin Shah ko Gussa Kyon Aata Hai?' conveniently discounting the obvious answers to the question. Hearteningly, for many out there, you are the Indian version of Geoffrey Kendall. Besides ceaselessly praying for your best mood, they constantly fear that 'you would get tired, sweaty and too preoccupied to deal with starstruck followers and in no mood to say or hear anything at all.' Let it not happen to them what happened to you way back then. And then one day, who knows, this interaction would help create a utopian culture of collaboration where makers and takers of audio visual media will collectively ensure that genuine actors are not relegated to play petty role players on stage or screen alike.